I made it safely to California and after having climbed three vaults every day in Nevada the 4,000 ft elevation gain to get over the Sierra at Carson Pass was almost a piece of cake. And then in California there were trees! Real big trees! With shade! And they were everywhere! No more sagebrush, hurray!!!! And I had a nice cycling finale on the American River Bike trail getting into Sacramento with great river views and a fantastic car-free bike path. But now I will stop cycling in the US and take the train to San Francisco. 1. 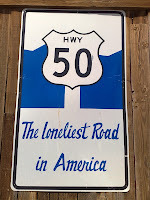 You are on a lonely road through a lonely area (like Highway 50). 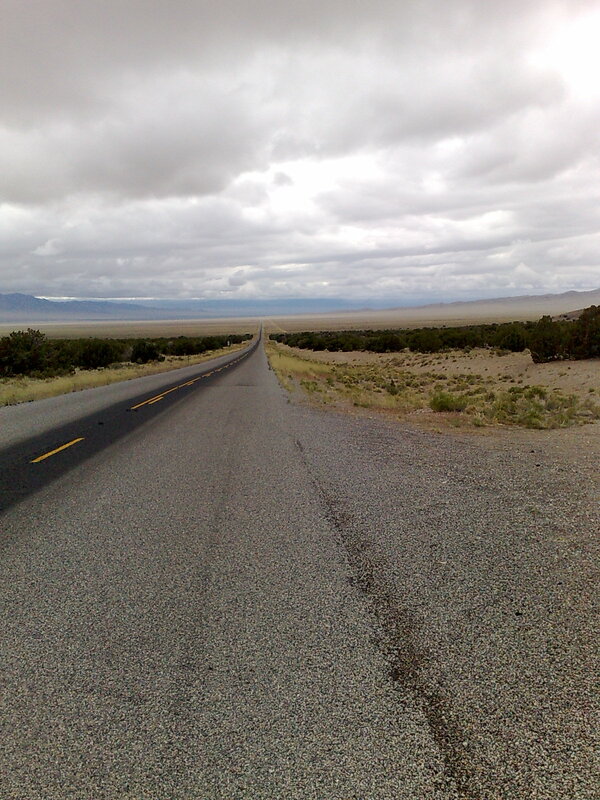 The good thing is that there is hardly any traffic and lots of public land for free camping. The bad news is that services (and especially water!) are very few and far between. So every day you have to cycle 70 - 80 miles to get to water. That is very doable, but the big problem is that you cannot plan your distances due to weather, especially the wind. I admit that I had very bad luck with the wind and all the locals told me that this is a very unusual year. Still that did not help me with the head wind.... So generally the problem is that you are very often totally exposed to the elements and have to deal with whatever they throw at you: heat waves, snow storms or head winds. I no other country I have felt so helplessly exposed than here. 2. You are in a more populated area with busier roads (like California): The traffic is really bad here, basically because the average American driver is not used to cyclists and has no clue what they are doing. Nobody looks over their shoulder when doing a turn to look out for cyclists. People do not know the dimensions of their vehicles when they pass you on a narrow road. Especially dangerous are seniors in their oversized American RV's pulling their car behind them and double-trailer mining truck who pass you at 70 mile per hour. Most young drivers think it is fun to honk or yell obscenities at you while they pass you. Also the camping situation gets really bad once you are out of public land. Everything is fenced in with hundreds of "No trespassing" signs making camping a real problem. I have experienced bad traffic in other countries as well but I have always felt that it is "worth" it - like in Japan where I cycled from temple to castle and even the little villages where fascinating. Here there was not really much to "see" en route. 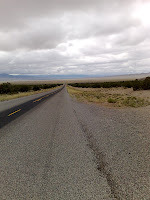 The scenery in the Great Basin was fascinating, but did not change for days... and the towns were pretty desolate. In Europe or Japan there were all these nice little stops to check out a church or interesting building - but here there was only sagebrush and fast food restaurants....(Ok, I might be exaggerating a bit here....Salt Lake City has definitely been a highlight.) Also, as I have written in an earlier post the combination between cycling and hiking did not work out very well either. But before I start my next outdoor adventure in Australia I hope to spend some leisurely days in San Francisco, Los Angeles and Sydney. 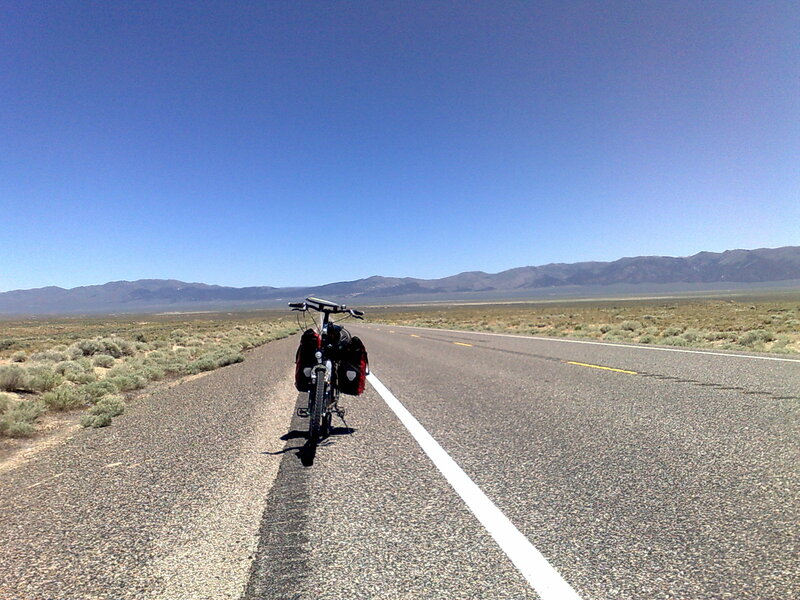 After leaving Salt Lake City I was working my way down to Highway 50 and the Adventure Cycling Western Express Route. 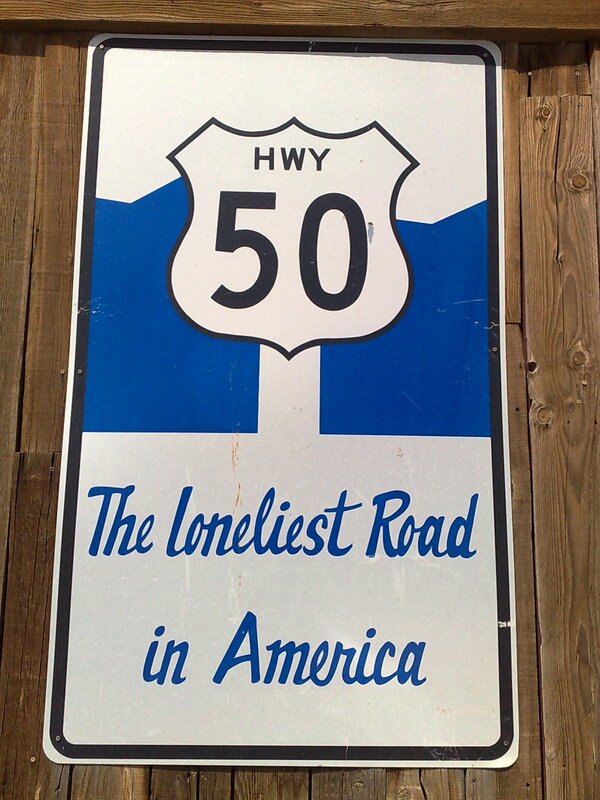 Highway 50 has been called the loneliest Highway in the US and is a major bike route in the US. I was really looking forward to it and meeting other cyclists. Alas, the weather was not my friend again! I had been warned about this stretch a lot. 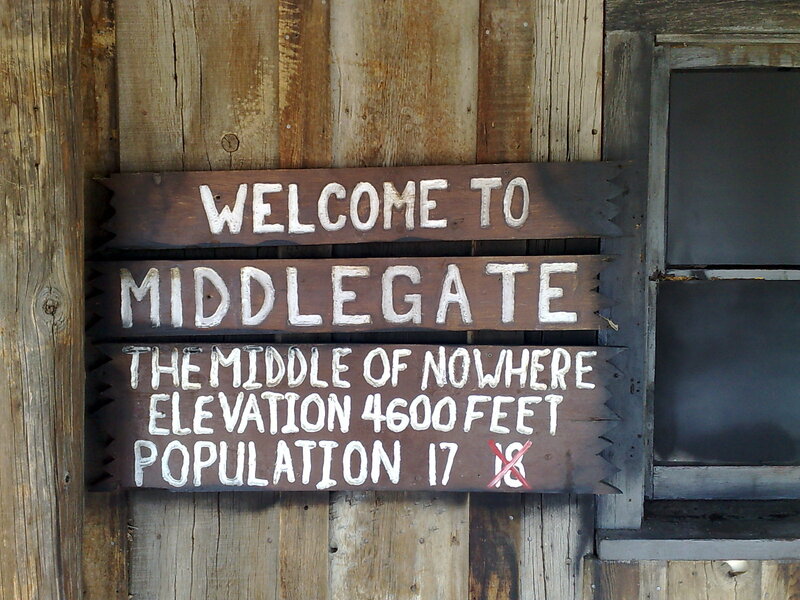 You cross whole Nevada and the Great Basin on it with no water except in towns and towns being more than 80 miles apart. Temperatures can rise up to 100 degrees Fahrenheit in summer and there is no shade whatsoever. But the weather decided to be unusual - El Nino style. It rained for the first few days!!!! And that meant it was cold. And it also meant that I had to do 1,000 meter elevation gains every day in my rain gear. All the cyclists will know what that means: You are sweating inside your raingear and eventually you are soaking wet from inside. So when you sit down and have a rest you start freezing.... It was miserable! The ascents took forever and I was wet and cold. I had to take breaks inside the drainage tubes under the highway to stay out of the wind and rain. And because I was cycling in the desert, there was no shelter from the wind for camping. 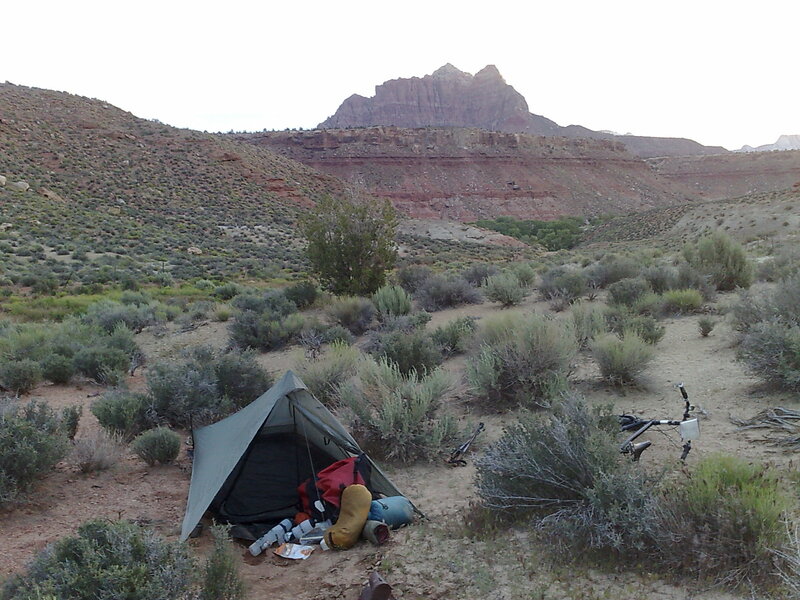 One particularly bad day I had to set up camp at 3 pm behind some lonely juniper trees. At 6 pm the wind got so bad that my tent collapsed (the tent stakes had come out) and I was in the middle of a sand storm covering everything with fine dust. That night I was in tears for the first time on this trip.... 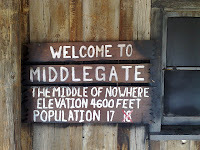 I had to cylce more than 60 miles the next day to get to the next town and water, but could I make that in that wind? I got up at 3.30 am in the morning and started cycling before sun rise to beat the wind. When I was approaching the next town around noon it started snowing on the last pass.... I am not kidding you: snowing and howling winds. I nearly had to push my bike downhill... but I made it!!!! Same thing happened two days after that: Headwinds with 50 miles per hour and a collapsed tent. I am fed up with it now!!!!! I am at the point where I am thinking of giving up on cycling for the rest of this trip. This wind is draining so much energy from me and is no fun at all. 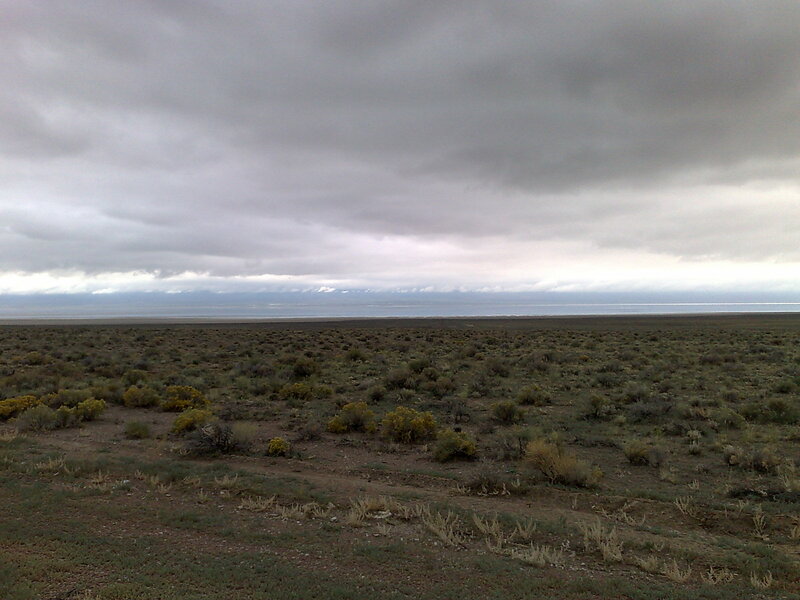 Also the geography has not been very helpful either: The Great Basin consists of an endless succession of basins (flat and wind from the front) and vaults (300 to 1,000 meter elevation gain about 2 times a day) - and I had to day about 80 miles in that every day! Luckily I am almost out of the Great Basin and Nevada: I still have to go over the High Sierra (I am not looking forward to that elevation gain! ), but then I am in California and hopefully then the wind patterns will change. Maybe there is such a thing as a tail wind? 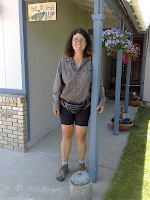 After having met 2 really nice and helpful Mormons (John, my fellow AZT hiker and the ladies who rescued me after my bike break-down) I was now really curious to learn everything about the Mormons. I moved to my next couchsurfing host Sue (who has been a Mormon decades ago) and spent the next whole 3 days on Temple Square (which is the Mormon equivalent to Vatican City in Salt Lake City). There was a lot to do! 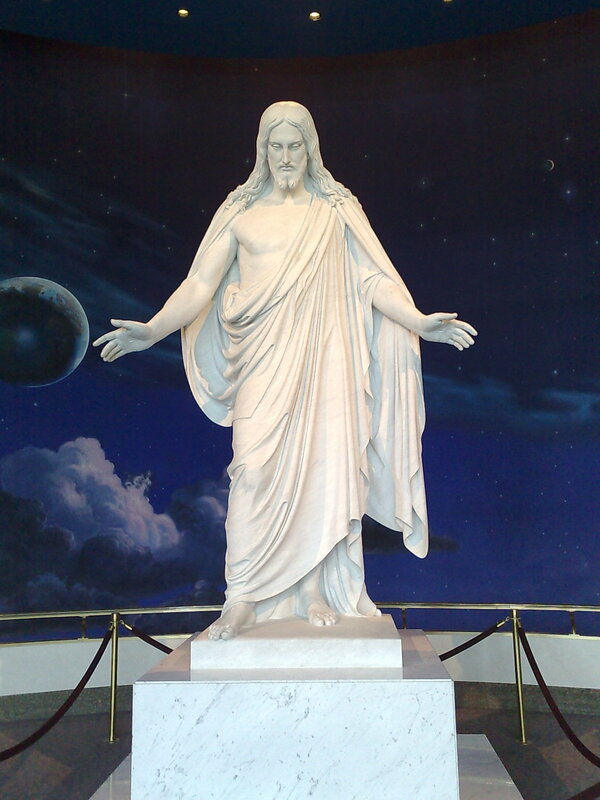 But for all of you who are afraid (or might hope for): I did not convert to Mormonism! Attractions and tours: There really is a lot to see. First of all there is the Tabernacle (the old Mormon meeting hall) where you can hear an organ concert. Then there is the new conference center that can host 21,000 people and offers a free organ recital as well. (It was kind of weird to hear the organ concert with just 5 other people in such a huge auditorium - and probably frustrating for the organist.) 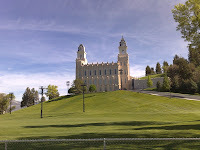 There is the Mormon Museum and the Beehive House (where the Mormon leader Brigham Young lived with several of his wives). I visited the Geneology Research Center (with free internet, hurray!) and took a tour of the gardens. But most impressive was my tour to the Humanitarian Society and the Welfare Square - both Mormon relief organizations. And as a former efficiency expert I was really impressed to see how well organized all these organizations were and how smoothly the tours were run. I did not know that the Mormons have special farms that only grow food for these humanitarian organizations. And what a coincidence: Back when I was hiking the Florida Trail, there was a huge road walk around Deseret Ranch - which is one of these Mormon farms! By the way: The Temple is like all Mormon Temples only open to Mormons with recommendation from their bishop. Missionaries: I guess we have all seen them before: Well-dressed, polite Mormon missionaries, always in pairs. Usually it is two young men, but on Temple Square there are only young women wearing ballerina shoes, skirts way below the knees and blouses with sleeves. They all carry the Book of Mormon with them - always. And they tried to answer all my questions - and I had a lot from birth control (yes, allowed) over divorce (difficult, but possibly) to homosexuality (not allowed to practice). They come from all over the world (I had tour guides from Switzerland, Scotland, Tonga and Paraguay), are incredibly friendly (my guidebooks says they can "nice you out") and to my big surprise they have to pay to become a missionary: 400 US$ per month for everyone, no matter what country they are working in - the Church levels it out among all missionaries. They cannot chose which country they are sent to - the Church assigns that and prepares them with intensive language courses. The Mormon religion is the fastest growing religion in the World: Right now the Church has more than 11 million members - no wonder with all that missionaries. It was a fantastic coincidence that only a couple of days later I found Jon Krakauer's book about Mormons and their fundamentalist split-off sects ("Under the banner of heaven") in the used book section of a library. 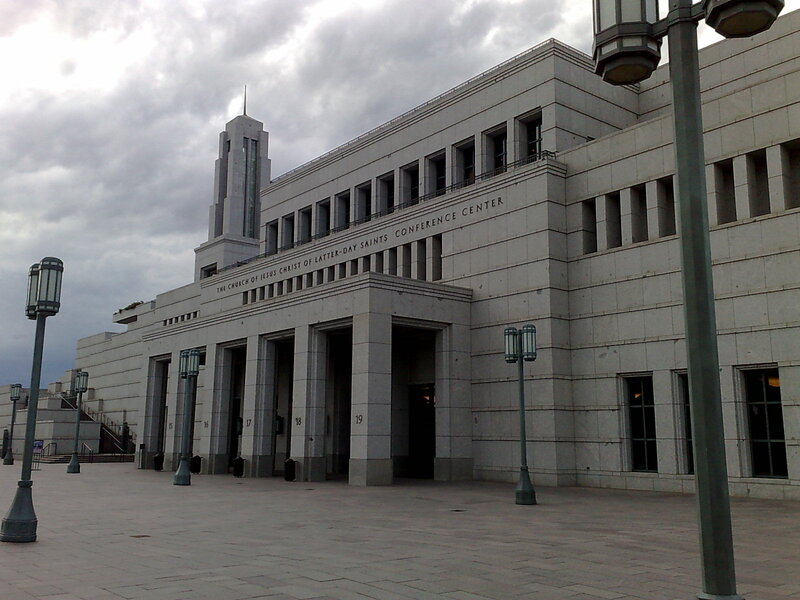 It was so interesting to compare what I had seen and heard on Temple Square with the historic background in the book. 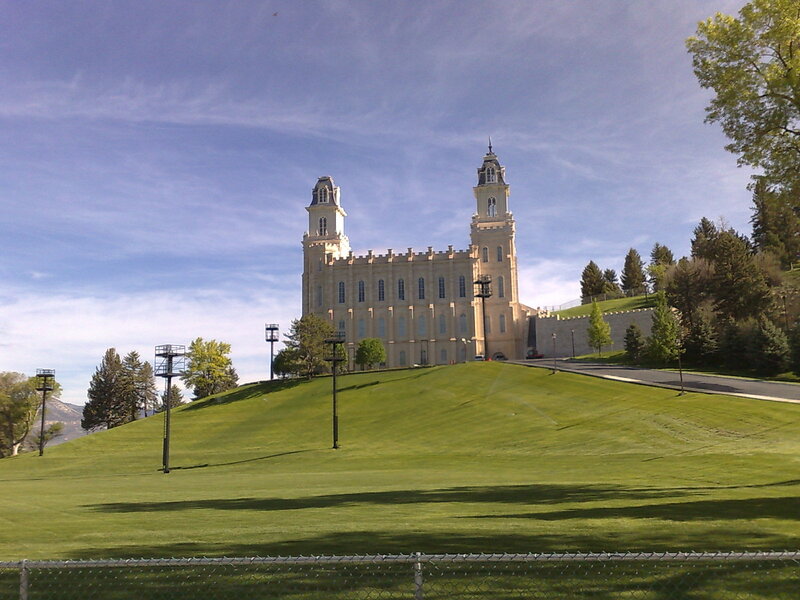 Polygamy is not mentioned with a single word in the monuments and museums on Temple Square, although is was practised by Mormons until 1890 and was the major reason for their prosecution. I had asked a missionary about polygamy and he explained to me that back then all the widows had to be looked after economically..... Krakauer states that most of the multiple wives were teenagers when married - go figure yourself. Another interesting fact is that Joseph Smith, the Churches founder, had been running for the American presidency and that the Mormons had quite a strong militia - after being prosecuted and forced into exodus various times. That explains why Mormons are allowed to serve military service. Bottom line for me: I found the Mormon religion extremely fascinating and colorful and the Mormons I have met were all incredibly friendly and helpful! And I learnt a lot - about the good AND the bad....and the discrepancies in the self-presentation of the Mormons and the historical background. After all those National Parks I was really looking forward to some city experience again - and SLC did not dissappoint me. It had been a good idea to cycle on Hwy 89, the Mormon Pioneer Highway. 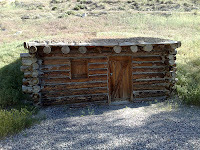 First of all it was pretty flat and second there were a lot of nice little museums and historical markers on the way. I was deliberating whether to cycle into SLC or take public transport from Provo, but after a horrifying road experience (due to construction work the road had been narrowed down to just 2 small lanes with no shoulder but lots of truck traffic) short of Provo I decided to take a bus. Good decision! The bus driver turned out to be a cyclist as well (he had 4 bicycles) and talked to me the whole way (one hour). I learnt everything about healthy nutrition (the guy seemed to live on amaranth and cous-cous only) and open cell foam (new light weight fabric). I still wonder how he would survive on a 5 months long hike without eating any sugar (bad for you) and only amaranth or other grains, but he was a very dedicated health nut. On top of all that a passenger took pity on me and give me a free can opener! (My little pocket knife does not have one and due to weight reasons I had left my big army knife at home). Seems that I always make friends on American public transportation. My bike survived the transport on the front bike rack of the bus although I could hardly watch it swaying back and forth there. The bus driver assured me that no bike has ever fallen off though! But I still had not seen anything of downtown SLC! But then I moved to a couchsufing host and started my Mormon experience! Utah generally is a great place for free camping because there is so much public land. So 2 nights ago I was targeting a little State Park as my camp site. Although I had looked it up on my GPS I sort of overlooked that I had to do a 100 m elevation gain off the main road. That does not sound much, but at the end of a long day (120 km at that point) this is a lot. I should have been warned by the sign post saying something about campground and golf course.... I still had visions of all these Arizona State Parks that were closed due to budget cuts. So I dutifully cycled up to that state park hoping that nobody would be there at 7 pm. I was so wrong! The whole place was teeming with people and they still charged entrance fee! Even I do not want to consider camping on a golf course and so I grudgingly turned around downhill to the main road. I had still 1 hour of daylight left and decided to cycle 5 more miles to a WMA (Wildlife Management Area). That place looked much better, although I had to pass the Sheriff's office on my way to it. I turned onto a minor dirt road and things looked pretty good for camping - when I realised that I was looking at an outdoor shooting range! Well, it was about half an hour of daylight left and there was nobody there and so I decided to take the risk and camp there. BAD decision! I was just about to set up my tent hiding behind some bushes next to the shooting range when the shooting started. I nearly wet my pants... Of course I was a little bit away from the shooting range but what where these people shooting at? Maybe at the tree I was hiding behind? I decided to lay on my back and seek cover - just in case. Surely the shooting would not last long - but it did! I pondered my options. I could come out of my cover and make people aware of me, but what if they shot me once I was out of cover? Also I was wondering who was practice shooting there? Maybe the sheriff's people? Ok, I was on public land and theoretically not doing anything wrong, but I really did not want to explain to the sheriff what a German woman was doing hiding behind a tree next to a public shooting range at night..... I remained in my shelter and did not even dare to cook dinner. I left early next morning and will never ever camp next to a shooting range again. I will be a TV star..... in Canada! Suddenly two cyclists in a colorful racing outfit showed up. They looked way too clean and smelled far too nice to be REAL cyclists, but cyclist is cyclist and so we started a conversation. Turned out they were from Montreal and touring with a film team! Later they confided in me that most of the time they were not cycling at all, but filming... They admired my bike (but called it a "tank") and came up with the great idea to incorporate me into their show. They were filming for a TV cycling and traveling series called "L'Amerique a velo" and showed landscape and tourist attraction en route of their presumed "cycling trip". (Most of the time they were riding in their camera team's truck. They were only cycling when they were filmed...) All this sounds pretty bad, but the two cyclists, the main stars so to speak, were really nice guys. One even owns a bike shop in Montreal and sponsors the show. So eventually I was given ice cream to look realistic (hey, that means I got paid for the shooting) and was filmed meeting the two guys, talking to them and actually cycling with them. Cycling around small town Torrey with a film crew in a truck ahead of you filming out of their truck generated a lot of attention and eventually even the sheriff showed up! Despite the fact that the "2 Canadian racing cyclists meet a German woman on a tank" scene had to be shot at least 5 times (and my ice cream was melting) the whole thing was great fun and I did not fall off my bike cycling between two racing bikes behind a truck. So now you can admire me on Canadian TV!!!!! 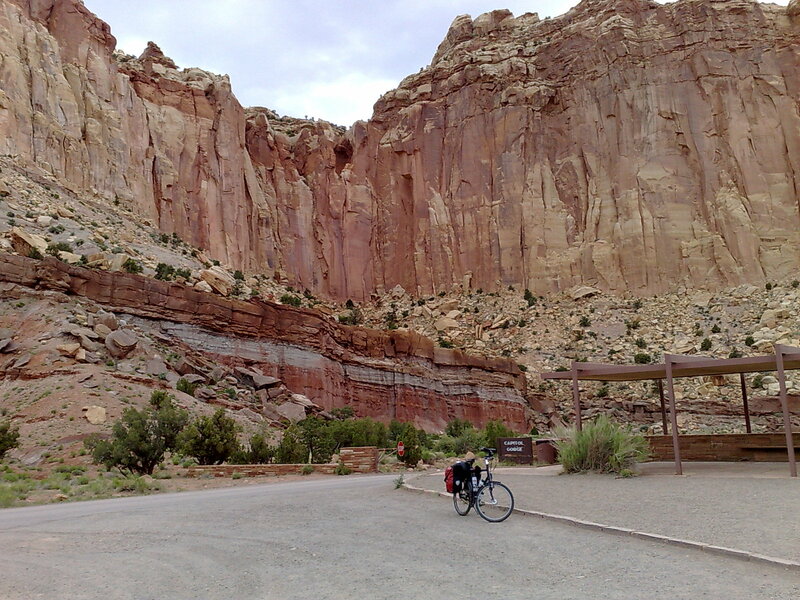 My plan had been to cycle around the Southwest USA doing the "Grand Circle" through the National Parks there and do some hiking in them. This plan has only partially been successful. Why? First of all, there is not really that much hiking to do in these parks. Most of the hikes are day hikes and if there are longer hikes, they require expensive shuttle services to or from the trail head. I do not mind paying for shuttles, but after hiking for so long it does not make sense to me to pay between 50$ and 100$ for a shuttle for a 2 day hike. 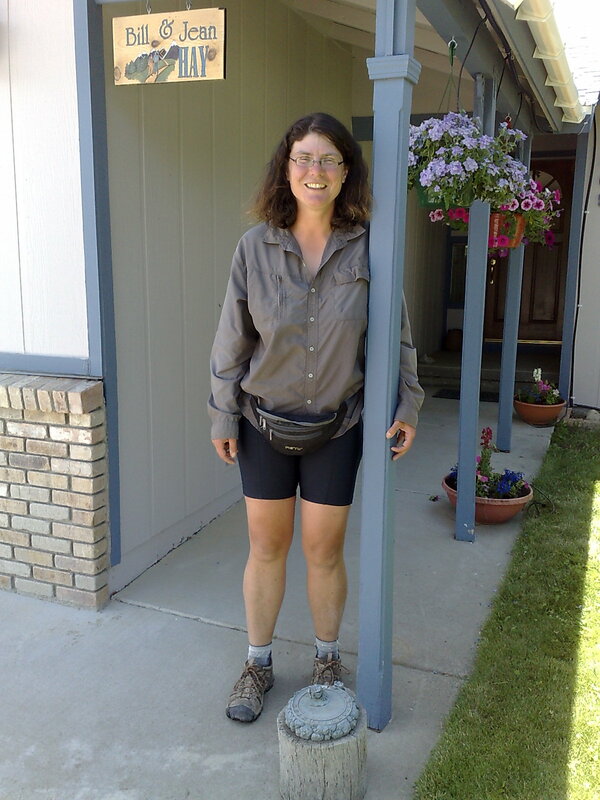 Second, there is the problem with what to do with the bike and the panniers while I am hiking. I have written about my experiences in my last post and bottomline is: The US NPS does not cater or care much for cyclists. You are pretty much on you own. Although it would probably be ok to leave the locked bike with the panniers on at the trail head, I personally did not feel very comfortable with it. These are my only worldly belongings right now and if something gets stolen it would be a desaster. Number two is shared between Bryce Canyon and Capitol Reef. Both are extremely unique and you do not find something like it anywhere else. 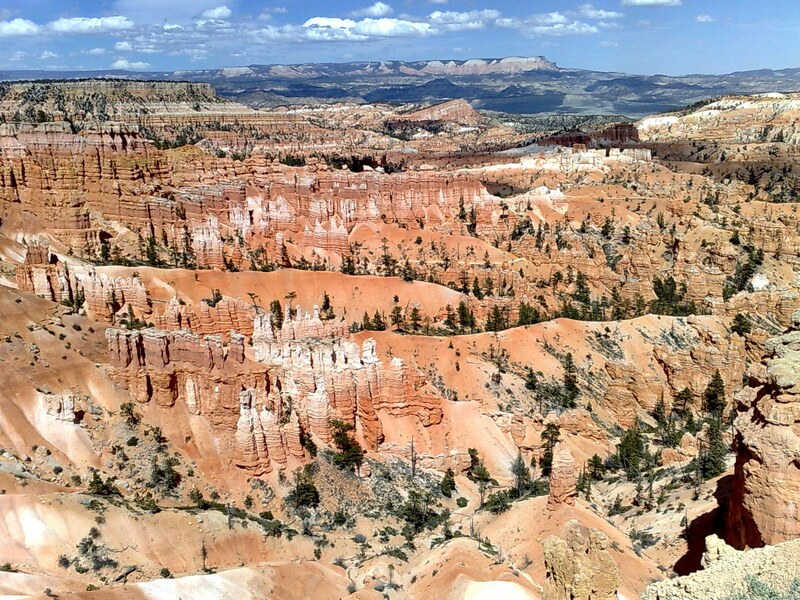 Bryce wins the prize for the friendliest rangers and actually had one overnight hike (Under-the-rim-Trail) that is accessible via free shuttle service. And it is very beautiful as well. 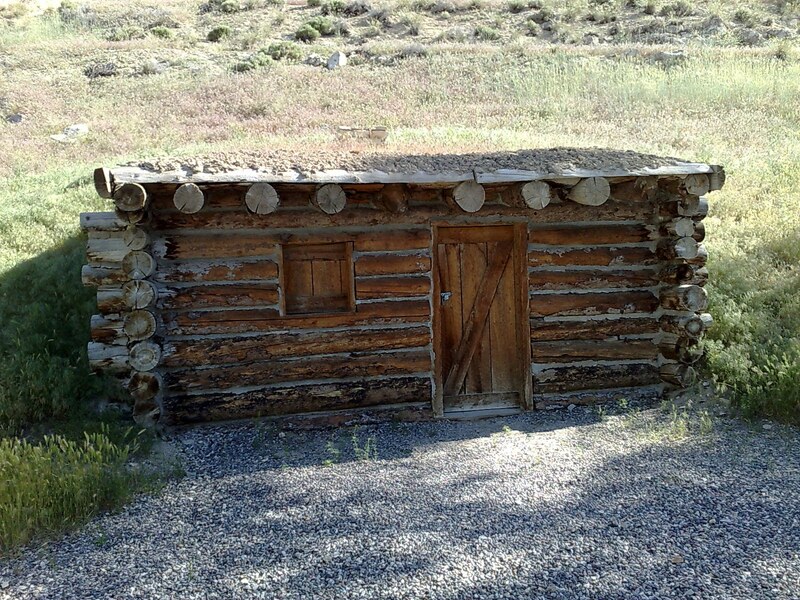 You can even connect it with some other hikes and make it a 2-3 day experience. 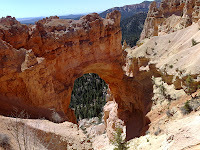 But that is it then - not much long-distance hiking in Bryce. There is even less hiking in Capitol Reef, but the park itself is incredible impressive. Just like you have seen in all these Western movies on TV. Cycling back and forth on the Scenic Drive was nice and gave me a great overview. 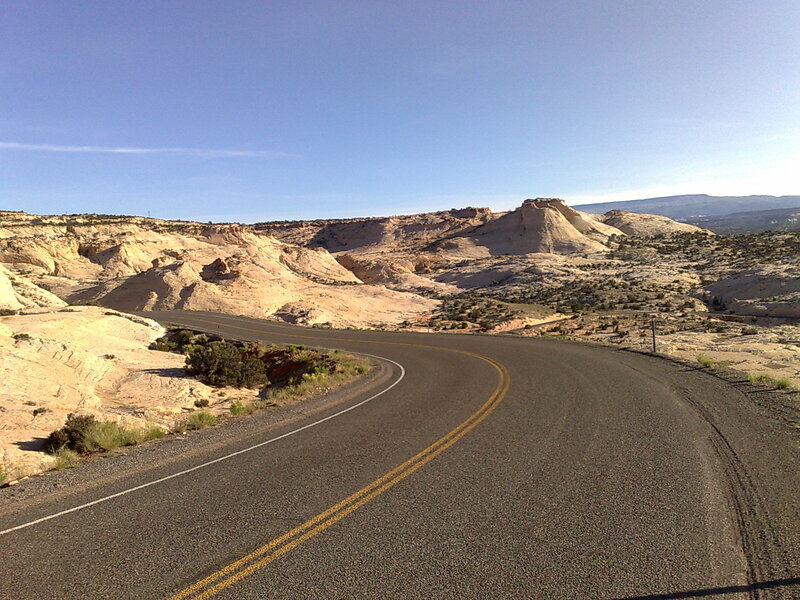 Don't miss Capitol Reef, despite what your guide book might say elsewise. Less recommended is Zion. This is not only due to my bad experiences with the rangers there (that is just personal bad luck), but mostly because it is most similar to what I know from Europe. It is very beautiful, but not as unique as the above mentioned parks. Also it is almost as overrun as Grand Canyon, the permit situation is horrible and everything is outrageously expensive. 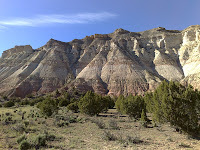 You can absolutely forget about Petrified Forest and Anasazi State Park - not worth even only 3$ entrance fee. Nothing to see at Petriefieed Forest and the exhibition at Anasazi is just boring. 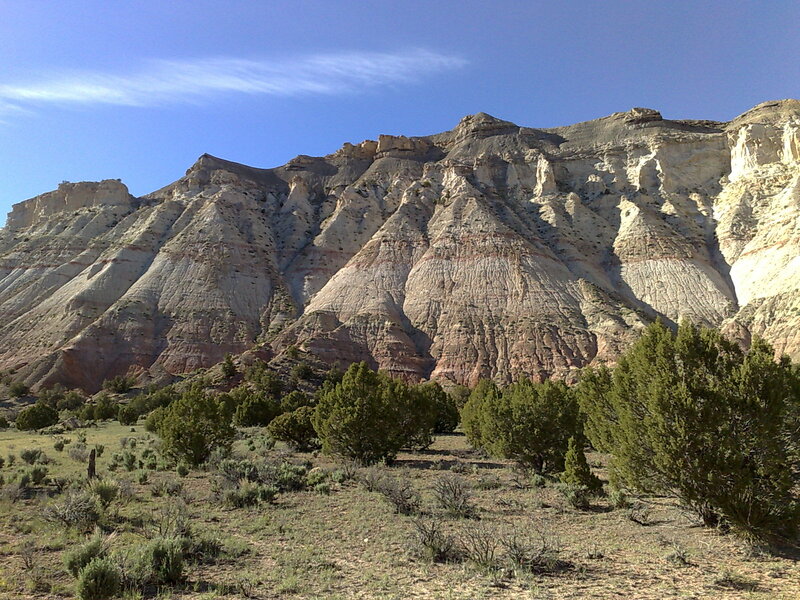 But there is one more hidden gem: Kodachrome State Park (which is actually really named after a Kodak camera film...). It is not as spectacular as the other parks, but very nice and pleasant - and so relaxing after being overrun by thousands of fellow tourists. Even cycling it was worth the 20 mile detour!!!! I am now canyoned out and on the Mormon Trail. I have one month left on my visa and will cycle towards the West Coast with my next stop in Salt Lake City. Let the wind be in my back!!!! I ended up staying 3 nights in the fabulous Sun 'n Sands Motel in Kanab. I tried to leave every morning, but there was another hazardous wind warning. I could see the trees whipping around from my window and was not happy. But having 2 rest days was so nice!!!! 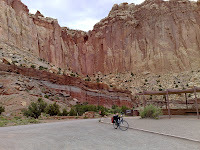 On day 1 I got my bike repaired and saw whatever is to see in Kanab. On day 2 I did nothing, absolutely nothing except eating and reading. Wonderful!!!! Well rested I started out to got to Zion NP. I had already seen both NP, Zion and Bryce in 2007 with my friend Maik. 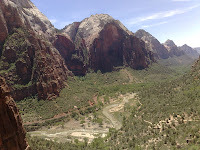 But then we were in a car and just got an overview - now I wanted to see the parks in depth and do some hiking as well. My adventure in Zion did not start well. You have to go through a narrow tunnel to get to the park and bicycles are not allowed in it. 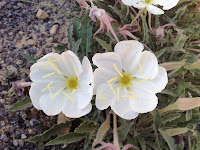 I asked the rangers at the entrance station about it and got more or less the following answer: "We can't help you there. Try to get a lift with a pick-up truck, but don't ask us for help. This is all your responsibility. We are just here to take your money...." Well, the hitch turned out to be very easy. When RV's go through the tunnel oncoming traffic has to wait till they are through and in that time you can easily ask for a ride. It took me 2 minutes and just one person to get my lift in (and later out of) the park. Down in the park things did not get better. All backcountry camping permits were gone and would have cost 10$ each - which is a lot considering that I have camped free for the last 4 months. The rangers were also extremely unhelpful when it came another problem: Where do I store my panniers and my bike while hiking? The answer was similar to the earlier one: "We can't help you there. It is all your responsibility. We are just here to take your money...."
I did not feel very encouraged and gave up on the idea of hiking overnight in Zion NP. But I did find a nice free camp site just out of the NP. 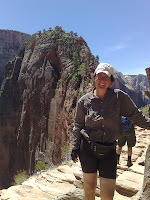 Next day I did some shorter hikes like the famous Angel's Landing where people were stepping onto each other's toes. After one day I was fed up with Zion. The rangers were very unhelpful, the park was crowded and everything was expensive. 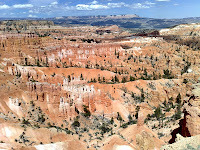 And so I left after another night at my free stealth camp site and cycled to Bryce Canyon. 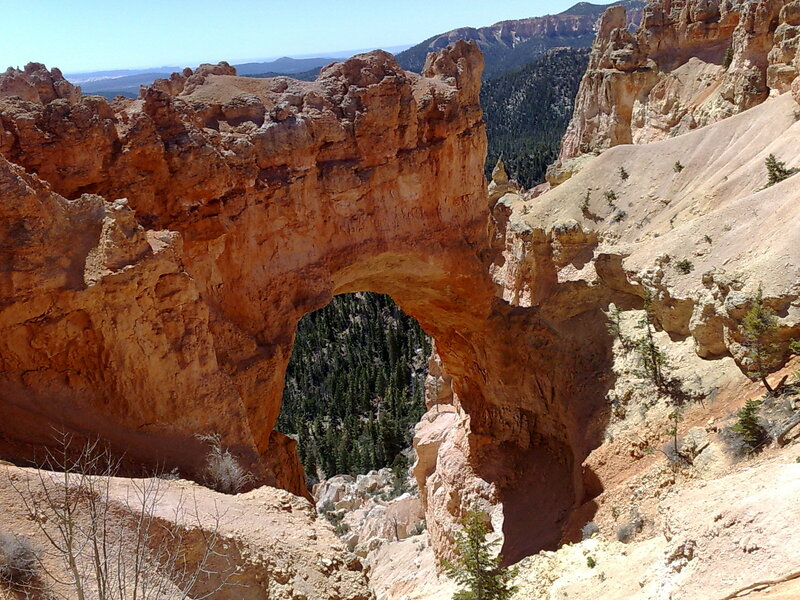 But what a different experience at Bryce. The rangers were really friendly and suggested overnight hikes for the next 2 windy days. The backcountry camping permit for 2 nights was just 5$ (as opposed to 20$ in Zion) and best of all: The rangers even offered to store my stuff for me!!!! 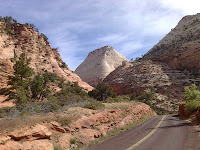 I had been so discouraged after my Zion experience that I hardly dared to ask. But the young ranger I was talking to was very understanding and disappeared to find out what to do with her superiors. I was asked to step into a side room and was given the following speech: "There are 2 answers to your question: Theoretically, we cannot store your stuff because it might contain a bomb or something could get stolen and then the NPS would be liable. So the official answer to your request is no. But on the other side we sometimes have to be flexible and bend the rules a bit... So, just leave your stuff here and I will store it in my own office." This ranger restored my faith in the NPS! I left my stuff and locked my bike in the employees parking area and went for a hike!!! And I had a great hike! There were thousands of people in the park, but out in the backcountry there was hardly anyone. I had great views and a fantastic hike! And I was so happy not to have to cycle in that wind! I retrieved my stuff after 2 nights (without any problem) and cycled on to Kodachrome State Park. Again the rangers were super friendly. 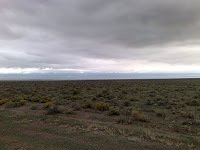 The camp ground was full, but I was directed to BLM land where I was allowed to camp. 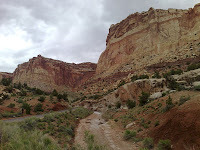 Next on the list was Capitol Reef NP. I had not seen that before and was really impressed with it. Backcountry camping permits were even free here!